See membership applications at bottom of page. Access to dog training grounds – PVHRC has access to three training areas for water and upland training. Members can use the training grounds for club events, individual or group training provided they adhere to club and training ground rules. Dog training tips from fellow members – There is a wealth of training and handling knowledge within the club that members share freely. Since the HRC is a non-competitive organization, people are very willing to provide and accept fellow club member’s advice. Dog demonstrations/seminars – Since dog training is our practice, the PVHRC attempts to provide new training techniques to its members. As such, professional trainers are often brought in to work with interested members. This is a great way to see how the pros get the results they are known for and for members to see how their dogs stack up to other top-notch dogs. UKC licensed hunts – Although not required, the PVHRC encourages each member to participate in hunt tests. Started, Seasoned and Finished tests are conducted regularly within the region. These tests are a great way to see how well your dog is progressing, give you experience handling dogs in real life hunting situations and are great fun. The tests are non-competitive whereby you and your dog are judged against the HRC standards by certified judges. Unlike other organizations, handlers handle their own guns while handling their dogs during the simulated hunts. PVHRC members can also participate in licensed hunt tests from other HRC clubs in Nebraska, Colorado, Utah and New Mexico. These regional events give the dogs exposure to different hunting environments with unique challenges. 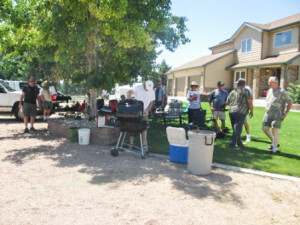 Family and club events – The annual picnic and auction provides fun for all family members. In addition, each hunt test typically provides an evening social and ceremony for all participants and family members. These are ideal settings for you to make new friends that share common interests with you and to “chew the fat” with old buddies. Monthly general membership meetings – The monthly meetings provide a forum for you to participate in the operations of PVHRC. The officers and fellow members are always looking for people to provide their input and assistance for all activities. Monthly club newsletter – The newsletter is printed each month to inform members of club events, membership meeting updates and to provide useful information and entertainment about retriever training. Subscription to Hunting Retriever Magazine – As a member of the HRC, you will receive a very informative journal six times a year. This magazine provides training tips, judge discussions, veterinarian articles and hunt test results from all hunt tests throughout North America. * Be sure to fill out the membership application and email or mail it to the Membership Chair person at the top of the form. This needs to be done if you are a new member or renenewing your membership for your signature and updates of your personal information.